› Author Affiliations Funding Research reported in this publication was supported by the National Institute of Dental & Craniofacial Research of the National Institutes of Health under Award Number R01DE022628. Background We can now quantify and characterize the harm patients suffer in the dental chair by mining data from electronic health records (EHRs). Most dental institutions currently deploy a random audit of charts using locally developed definitions to identify such patient safety incidents. 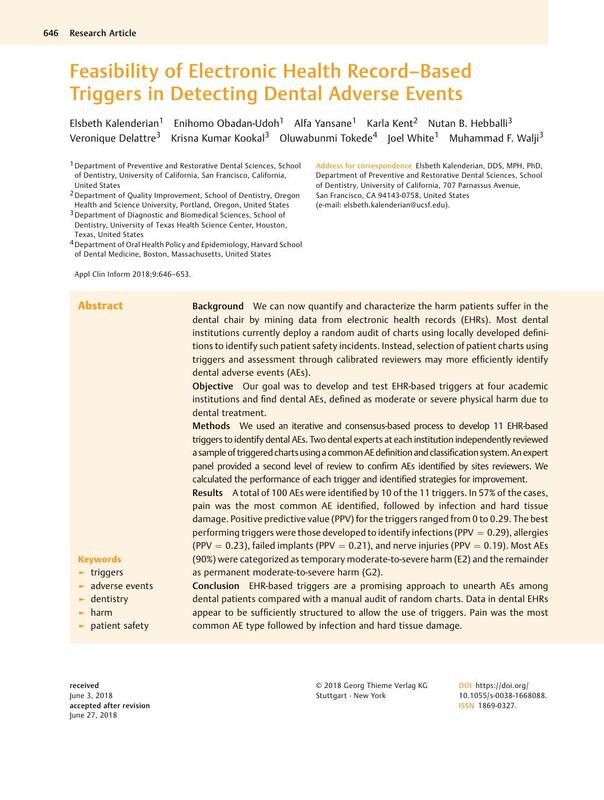 Instead, selection of patient charts using triggers and assessment through calibrated reviewers may more efficiently identify dental adverse events (AEs). Objective Our goal was to develop and test EHR-based triggers at four academic institutions and find dental AEs, defined as moderate or severe physical harm due to dental treatment. Methods We used an iterative and consensus-based process to develop 11 EHR-based triggers to identify dental AEs. Two dental experts at each institution independently reviewed a sample of triggered charts using a common AE definition and classification system. An expert panel provided a second level of review to confirm AEs identified by sites reviewers. We calculated the performance of each trigger and identified strategies for improvement. Results A total of 100 AEs were identified by 10 of the 11 triggers. In 57% of the cases, pain was the most common AE identified, followed by infection and hard tissue damage. Positive predictive value (PPV) for the triggers ranged from 0 to 0.29. The best performing triggers were those developed to identify infections (PPV = 0.29), allergies (PPV = 0.23), failed implants (PPV = 0.21), and nerve injuries (PPV = 0.19). Most AEs (90%) were categorized as temporary moderate-to-severe harm (E2) and the remainder as permanent moderate-to-severe harm (G2). Conclusion EHR-based triggers are a promising approach to unearth AEs among dental patients compared with a manual audit of random charts. Data in dental EHRs appear to be sufficiently structured to allow the use of triggers. Pain was the most common AE type followed by infection and hard tissue damage. This study was performed in compliance with the World Medical Association Declaration of Helsinki on Ethical Principles for Medical Research Involving Human Subjects and was reviewed by the Institutional Review Board of each participating institution.